The process of laser hair removal occurs specifically with melanin located in the hair follicle. The laser absorbs the melanin which is defined by a specific laser wavelength with proper melanin absorption. The laser has enough energy to selectively remove the target area before it produces heat, and thus does not burn surrounding tissues. The main principle of laser hair removal is a controlled thermal damage to the hair follicle while being cautious of the surrounding tissue. For long-term hair removal, the epidermis should be preserved while the hair follicles within the dermis are destroyed. These areas are located deep in the skin, so it requires significant amount of energy to destroy these. 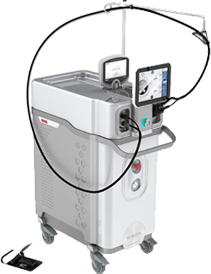 For this, a laser with longer wavelength and long pulse is required to deliver sufficient energy deep inside the skin. 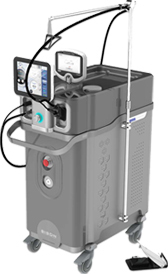 Long pulsed lasers have period of resting time on the skin which is effective and a long wavelength of 3 gold standard laser wavelengths options of 1064nm & 755 nm combination the Dual Accento laser system or 808 nm diode laser the Diode Ice laser system is then used to penetrate deep enough to target the hair follicle in the skin for effective laser hair removal. 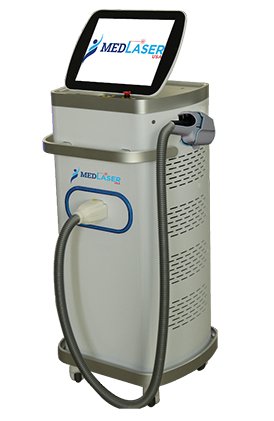 IPL intense pulse light lasers also provide effective laser hair removal results like the MedPulse IPL. 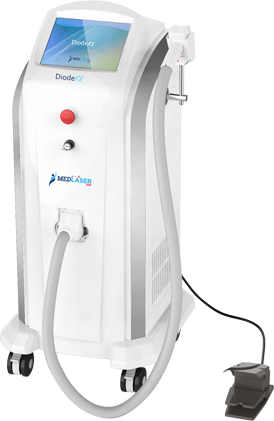 Laser hair removal is a noninvasive technique that uses highly concentrated light to penetrate hair follicles. The laser light is absorbed by the pigment in the hair shaft in the follicle-generating heat which damages the follicle to inhibit future hair growth. Therefore, plucking hair before treatment reduces the efficacy of the laser treatment as the target is absent. Special care must be taken for those with darker skin. A less intensive laser should be used to avoid damaging the outer skin. Anyone who has tanned, used a spray tan or gone to a tanning booth should wait until the tan has faded as the pigment in the skin absorbs the laser light and reduces the effectiveness of the treatment. These risks and others will be fully discussed prior to your consent. It’s important that you address all your questions directly with your laser hair reduction provider. No sun-tanning or self-tanners 4 weeks prior to treatment Includes spray tans, tanning lotions, tanning beds, sun exposure, etc. Hair removal requires a series of treatments. The number of treatments depends on body location and type of hair.